Here’s the A-side of a 1969 two-part dance-inducer I uncovered in Memphis last year. I know very little about Chuck Cornish or this record, other than it comes from an era when he and several other New Orleans-related artists (Danny White, Betty Harris and Robert Parker) had one-off, funkified releases on Shelby Singleton’s Nashville-based SSS International Records. The label also issued nearly a dozen singles by Johnny Adams during it’s run. While Betty Harris' single that year for SSS (#766) featuring the killer "There's A Break In The Road" definitely was cut in New Orleans with three of the Meters plus James Black on drums, questions have come up about White's (#754) from 1968. There is some evidence that it was cut earlier in Memphis and then leased to Singleton through Allen Toussaint & Marshall Sehron's Tou-Sea/Sansu Productions. 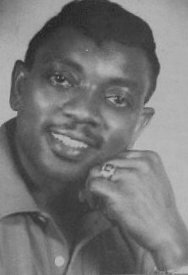 Meanwhile, Robett Parker had two singles leased to Singleton in 1969 and 1970, "You See Me"/"You Shakin' Things Up" issued on Silver Fox, and "The Hiccup"/"Rockin'Pneumonia" on SSS (#819); and it has come to light that Bob Robin produced those sessions in Muscle Shoals. Of all of them, Cornish's 45 still has the most questiom marks about its point of origin, though I favor New Orleans. 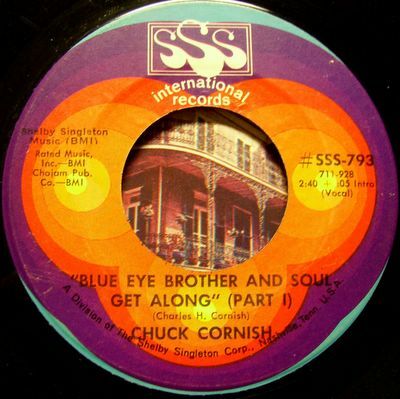 One thing I do know is that I sure cotton to "Blue Eye Brother And Soul Get Along". Even the title is syncopated; and the entrie song is upbeat in rhythm and theme. I mean, who can argue with it’s “make this world a happy home” sentiment addressed to the both sides of the racial divide? The drums give the track a strong start and add a tasty dash of funk flavor throughout. You can also get a hint of Chuck’s hometown in the way he pronounces the first word in the phrase "burnin'and lootin’” as "boynin'". Prior to my finding this 45, Chuck Cornish was familiar to me mainly from a cool cut of his, “Ali Funky Thing” (which tried to live up to its title) on the first Funky Delicacies/Tuff City Funky Funky New Orleans CD compilation. That song, which I have since acquired on the original two-part single came out on Wand 11272 in 1974, and, as far as I can tell, was the singer’s last release. His first (and only other) seems to have been "A Tribute To Mohammad Ali"/“Let’s Go Steady” on Cosimo Matassa’s White Cliffs label (#258) out of New Orleans around 1967. Obviously, Chuck had a few things he needed to say about the former Cassius Clay. Other than his three singles, I find that, in the late 1950’s and early 1960’s, Cornish co-wrote a number of tunes with standout collaborators on the Crescent City scene, such as Dave Bartholomew, Adolph Smith and Pearl King. But I have yet to track down who recorded them. 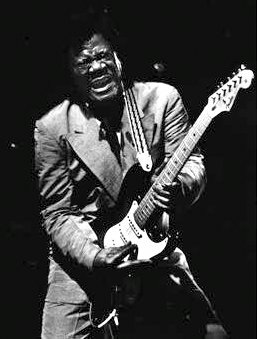 Since he also composed the songs on his solo releases, I think it’s safe to say that Chuck Cornish, if not prolific, was a well-qualified songwriter, who adapted to the times, turning out some groovers certainly worth remembering in the funky stack o’ tracks that emanated from the Home of the Groove around the start of the Seventies. This find comes from a large lot of 45’s I bought last summer. I had never seen or heard the single before; but, reading the label made me curious. As you will note, it reveals that Tommy Ridgley produced it at Knight Studio in Metairie, LA (western suburb of New Orleans), and that Play Records was based in New Orleans. We’ve discussed Knight Studio and the Knight label, owned by Traci Borges, here before, as Eddie Bo was associated with them during the late 1960’s into the 1970’s. Being unfamiliar with Rose Davis, too, I recently got around to digging up what background I could find about the artist and this single. 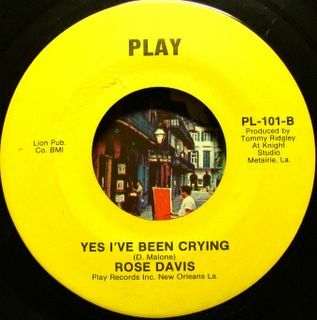 I’m presenting “Yes I’ve Been Crying”, the mid-tempo B-side, as a curiosity more than anything, as Ridgley’s production gives the song a strange dual arrangement that certainly wasn't a part of the original Deadric Malone composition (originally done by Lavelle’ Miss Lavell’ White on Duke in 1959). The main body of our feature is done in a sauntering, early 1960’s Popeye-style groove (the horns playing a line lifted from Chris Kenner’s “Something You Got”) with a nice, funky drum shuffle added, while the bridge twice shifts into a 1950’s R&B arrangement similar to Dave Bartholomew’s band backing Fats Domino (and closer to what the original version's arrangement was like). Not only do the two styles not cohabitate particularly well here, but, in 1973, both were long past their “sell by” date. Despite the “re-muddling”, good musicianship and Davis’ decent vocal make the song worth a few spins anyway. Ridgley is probably on piano here; but I won’t venture a guess on the other players. The top side, “Sittin’ And Drinking”, is a fairly well done slow blues cover of a Christine Kittrell song. According to John Broven, in his fine book, Rhythm & Blues In New Orleans, Davis’ version was briefly popular in New Orleans upon its initial release; and, probably on the strength of that local noise, the record was picked up by Excello, which put it out (#2335) in 1973 or 1974. Soon thereafter, the Nashville label issued another Davis single (#2337), “That’s Enough” b/w “Kiss Tomorrow Goodbye” (which, I believe, is a cover of the 1963 Danny White side), that seems to be her last recording as an artist. I see that she sang backup on Ridgley’s 1992 CD, How Long, in my collection, but have uncovered no other mentions of her, before or since. As Broven points out, Play 101/Excello 2335 was one of singer/songwriter/bandleader Tommy Ridgley’s first ventures as a record producer. I don’t know for sure that he oversaw Rose Davis’ other Excello single, but it is likely. Hearing “That’s Enough” at the Soul Club link, I’d say it’s a much better production. So, we’ll call the influences at cross-purposes on “Yes I’ve Been Crying” an experiment, a learning experience. That just makes the Play single, apparently the only release on the label, a more interesting artifact. As far as I can tell, Rose Davis was one of the few artists, if not the only one, Ridgley ever got to produce. If you know of any others, please drop me a comment or an e-mail. After King Floyd returned to New Orleans from California (see prior post) in 1969, he began working at the post office, but soon made fateful contact with both Wardell Quezergue and Elijah Walker. A wheeler-dealer promoter, Walker arranged for several New Orleans artists, including Jean Knight, the Barons and Joe Wilson, to go to the fledgling Malaco Studios in Jackson, MS and record some tracks, with Quezergue doing the arranging. Floyd, too, was included on the one day outing in May, 1970, getting to record his own “Groove Me” and “What Our Love Needs”. Amazingly, that productive session eventually yielded two #1 hits, Knight’s “Mr. Big Stuff” and Floyd’s “Groove Me”. Today’s feature, “Here It Is”, is one of a string of worthy sides and albums Floyd made at Malaco after his initial hits; but they just did not catch fire with the public. 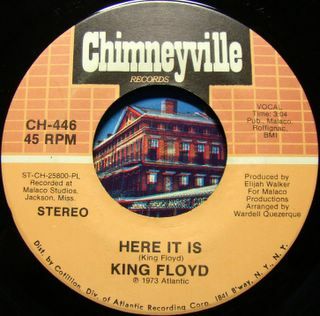 While this version is from his 1973 Chimneyville single, the song also appears on his fine (and maybe his best) album, Think About It, which ATCO put out that same year. The soulful, mid-tempo title track, written by Otis Redding and Don Covay, is the on other side of this 45. 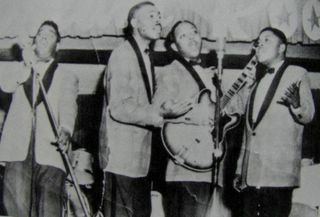 As with virtually all of the sides King Floyd did at Malaco, the core backing musicians on “Here It Is” were the in-house studio band, anchored by James Stroud on drums, who could serve up a deadly dose of syncopation. The tasteful and tasty Vernie Robbins was on bass; and, I believe, Jerry Puckett was still the guitarist at this time. Quezergue, arranged, produced and played keyboards on most of Floyd’s sessions up until 1973. Although Elijah Walker is shown as producer on many of Floyd’s recordings from the period, he was more of an executive producer than a hands-on studio type. I find the King Floyd story intriguing because he never recorded anything in his hometown; and very few HOTG players were ever on any of his sessions. Thus, while it’s soulful funk, King Floyd’s sound is not immediately identifiable as a New Orleans product, although the influence is certainly there. All in all, “Here It Is” serves as a good example of the unique blend of styles Floyd and Quezergue brought to bear on so many of the their collaborations: a simple, uncluttered Memphis soul kind of feel, merged with an often funked-up New Orleans essence, and birthed (as I’ve mentioned before) in a city almost equidistant between those two musical wellsprings. Throughout his catalogue, Floyd’s rather high, always youthful sounding tenor has always reminded me of Joe Tex in a way; but his vocal style, which can range from raspy get-down to velvet smooth, is certainly his own and easy to identify. I really liked his funky style of singing. I feel his singing had a little Otis Redding in it, especially when it came to the slow tunes. A note of fact is that he was tone deaf; and yet his singing was good. When he would write lyrics, he truly studied and took the time necessary to get it right. . . On the other side of the coin, he had an odd personality and was a difficult person to work with through the creative process. Unfortunately, he burnt a lot of bridges along the way, which is a common thread for some artists. Note: again, many of his best Malaco-era sides can be found on the Choice Cuts CD compilation. New Orleans native King Floyd, III, who passed away on March 6th at 61, grew up in the intense, post-WWII musical atmosphere of the city, which was heavily laden with the heady rhythm and blues and early rock ‘n roll that changed the world. Deciding to become a singer at an early age, he was inspired not only by seeing and hearing the likes of Earl King, Ernie K-Doe, and Irma Thomas in their early days, but by national stars like Sam Cooke and Jackie Wilson. While still a teenager in the early 1960’s he got his first gigs on Bourbon Street, but soon was in the military. Upon his discharge, he began singing professionally again, not in his hometown, but in the New York City area, and working on his songwriting, learning the ropes from such masters as Don Covay and J. J. Jackson. He then moved on to Los Angeles to seek his fortune, arriving in the mid-1960’s and encountering a number of New Orleans expatriates in the business there, including producer, arranger, musician Harold Battiste, whom he knew from back home. 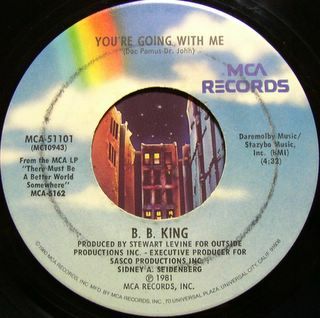 Battiste’s connections got Floyd into the LA scene; and the young singer soon recorded his first single, “Walkin’ and Thinkin’” b/w “Why Did She Leave Me?”, released on Original Sound. From there he was able to get an album deal with Pulsar, again with the help of Battiste, who also produced and arranged on the project. The result, A Man In Love, was issued in 1969. 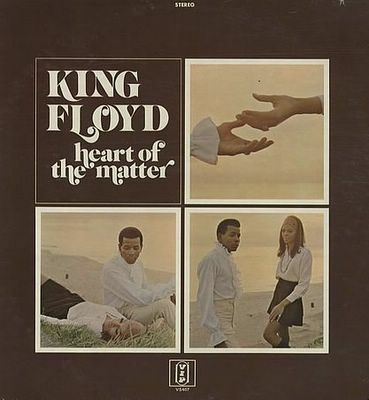 Today’s feature, “Love Ain’t What It Used To Be”, is taken from that album, although my copy is a 1971 VIP (Motown) re-issue of it called, Heart Of The Matter, that was put out to cash in on King Floyd’s new popularity when “Groove Me” hit. As good as the album is, with Floyd writing or co-writing (two with Mac Rebennack!) every song on it and singing well throughout, it does not really reveal anything of the soulful funk that he would pursue in the 1970’s. I’ll address that in another post; but, for now, as this song reveals, Floyd’s direction on his first LP was more of a soul/pop sound with a definite Motown influence. I find his songwriting ability to be surprisingly well-developed and consistent on his first full-length effort. Surely, Harold Battiste’s hand in developing the record and doing the arrangements had much to do with the over-all quality of the finished product. Although I have no session information on this album, it is likely that there are some New Orleans musicians on it, as Battiste had access to a pool of HOTG talent that had re-located to the West Coast; but, despite its positives, A Man In Love, was not promoted and did not sell. And after spending a while longer in California with no more recording opportunities forthcoming, performing sporadically, and writing for other artists such as Alvin ‘Shine’ Robinson and Jane Mansfield (?! ), King Floyd moved back home, soon to begin the more successful phase of his career. I’ll be featuring more about that in my next post. But, ‘til then, enjoy this nice bit of up-tempo soul and the smooth tenor voice of a young man getting his first big break. And, by the way, what's up with that puffy shirt? “The Real McCoy” features one of New Orleans’ finest, Earl King, backed by the Meters on an Allen Toussaint production for Sansu, which recorded more than an album’s worth of King's material in 1970. Sansu partner Marshall Sehorn had interested Atlantic Records in releasing an LP from the sessions; but Atlantic wouldn’t give Sansu an advance. So, in another tragic showbiz twist of the knife, the majority of the project, certainly Earl King’s best showcase since his Imperial sessions in the early 1960’s, got shelved. Only three singles were released at the time, the Mardi Gras themed “Street Parade” on the obscure Kansu label, and two unsuccessful issues leased to the Wand label in New York [one of which I have since found and featured here]. So, King’s comeback hopes were dashed. In the early 1980’s, Charly in the UK licensed the tracks and released their Street Parade LP (and later CD*), which is where I first discovered this lost trove of soulful funk, around the same time that King was beginning his re-emergence with a series of fine CDs for Black Top. The general consesus is that the Meters played on all of these sessions; and listening to the tracks confirms it. That surely goes for “The Real McCoy”, which definitely has the Meters sound and feel about it, although I don’t hear any keyboards at all. Listen to the quirky, off-kilter drum syncopation that only Zig Modeliste could pull off with such a combination of nonchalance and near abandon. The guitar work has the stamp of Leo Nocentelli’s early style: clean, agile riffing and rhythmic chording. King is probably doubling the central riff with him. And what bassist other than George Porter, Jr. could find that funky bottom end and keep up with Zig and Leo? Nice horn charts, too, which Toussaint arranged. There are a few other tracks with this much Meters’ stylin’; but the Street Parade sessions have plenty good grooves and well display King’s unique songwriting gifts. The other featured Kings in this series were blues men who had no direct connection with the Crescent City but, in various ways, crossed paths with its music at some point and felt its influence. Earl King (born Earl Silas Johnson, IV) is a different story, as he was proudly in and of the HOTG heritage. He may have started out playing the blues (even impersonating his indisposed mentor, Guitar Slim, on the road in his early days), but he had a much broader musical palette that he developed over a nearly 50 year career. Although King made some great records as a performer, his main strength from the start, and his ultimate contribution to New Orleans’ musical legacy, was his songwriting. “Those Lonely, Lonely Nights”, “Come On”, “Trick Bag”, “Big Chief”, “Teasin’ You”, and “ Make A Better World” are just a few of his compositions. He performed many of them himself; but they got the most attention when performed by others: Lee Dorsey, the Dixie Cups, Danny White, Willie Tee, Professor Longhair, James Booker, Dr. John, Jimi Hendrix, et al. I’ve featured and spoken of Earl here before and will again. There’s simply no getting around what a profound role he plays in the whole HOTG story, not just as a composer and songwriter, but a great producer, too. About a decade before his 2003 passing, I was lucky enough to have him on my WEVL radio show when he was in Memphis for a gig. This friendly, soft-spoken, humble man was a font of information. I wish I could have talked to him for days and days, ‘cause he truly was the real McCoy. *Note: Street Parade has seen several more CD incarnations. In 2003, Fuel 2000 released it; but that’s been deleted, looks like. Now Aim out of Australia is having a go at it. You can look over pretty much all of what’s currently available on CD for Earl here. And a happy St. Paddy's Day to ya. As my my friend, Red Kelly, over at The "B" Side notified me yesterday, the great New Orleans soul and funk performer and songwriter, King Floyd, has passed away. Red has an obituary up at his fine site, plus one of Floyd's early sides, recorded in California. As I can't get to posting a King Floyd track for a while (plenty of material, but no time! ), I'm glad Red has something to remember him by. Also, while you're there, check out that great Ann Peebles track he has up. Love that Memphis woman. Update: soul sides also has some tracks by King Floyd up now, too. I will do a post on him next week and am also working on an interview with one of his collaborators during the Malaco days that I hope to have for you fairly soon. 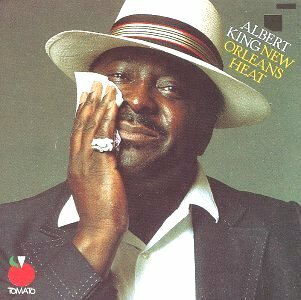 Albert King recorded New Orleans Heat at Sea-Saint Studios with Allen Toussaint producing in 1978. I got the LP, which had already been cut out, in the early 1980’s; and I bought the 1989 CD issue, too, playing cuts on my radio show from time to time. 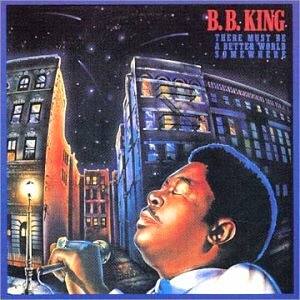 Although I don’t think this is a desert island disk, the album captures an interesting meeting of a Memphis area blues master, who had his own unique funk sensibility, and some of New Orleans best session players*, including two of the Meters, and songwriters. It is also notable as the last credited session I know of for the great Charles ‘Hungry’ Williams, who played drums on five of the nine cuts. His career went back to the later 1950’s, when he took over the first-call drum chair in New Orleans, after Earl Palmer left for Los Angeles. Or course, our feature track, “Get Out My Life Woman”, is a cover of the Toussaint-penned classic originally ridden high in the charts by Lee Dorsey in 1966. On this re-make, Toussaint moves the song out of the slow plaintive funk mode, allowing ‘Hungry’ to up the tempo a bit and give it an infectious, swinging syncopation that the players lock in. That it feels so good really works against the subject matter of the lyrics; but, what can you say? In New Orleans, groove trumps blues. If this bothered Albert, he doesn’t show it, delivering a comfortably relaxed vocal, while bending the strings expressively. In a nice touch, Toussaint picks up on the guitar as another voice and has one of the background singers double a line in the solo. And I dig the Memphis way King says “climb” in the line, “Get off my ladder, woman, I’ve got to ‘clam’ up to the top”. So down home. On the album, King redoes several of his earlier Stax sides, including the classic “Born Under A Bad Sign”, which is given a good ride by drummer June Gardner and the band. Other outstanding tracks are Leo Nocentelli’s deceptively titled funk vamp, “I Got The Blues”, (which, as good as it is, clocks in at nine minutes and should have been reduced by half) and Toussaint’s strutting truism, “We All Wanna Boogie”. The only space holders on the album for me are the well-done but out of place ballad, “The Very Thought of You”, and Larry Hamilton’s composition, “The Feeling”, that is just a rip of “The Thrill Is Gone”. One of Larry’s funkier numbers could have made the record extra spicey. This foray into the heat and damp of the Deep South was one of Albert King’s last studio projects, although he continued to perform until his death in 1992. Although it didn’t light any fires with the public, I’m glad Albert gave this collaboration a shot, leaving us more tunes worth remembering from the legendary, and now abandoned home of Sansu Productions on Clematis Avenue. 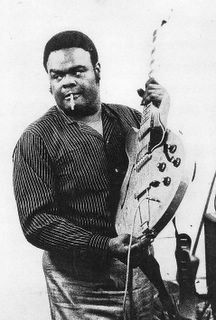 As a fan of blues belter, guitar giant Freddy (a/k/a Freddie) King and a stone New Orleans music freak, I had noticed the similarity of the main riff and the melody line in King’s classic instrumental, “San-Ho-Zay”, to Tommy Ridgley’s song, “Double Eyed Whammy”. Ridgley recorded his swingin’ slice of proto-funk in late 1960; and it was released early in 1961. “San-Ho-Zay” was cut in April, 1961 and charted that July (#4 R&B, #47 Pop). Jeff Hannusch, in his second book on New Orleans R&B, The Soul Of New Orleans, calls King’s side a “cover” of Ridgley’s; but, to put it more accurately, Freddy appears to have appropriated Tommy’s tune, changed it a bit, and re-titled it without giving the writer credit and depriving him of royalties from the hit. That’s the music business. All’s fair unless you’re caught. This was on Bo’s third single for Ric b/w “Tell It Like It Is”. The title is mistakenly shown as “Every Dog Has Its Day” on the Rounder comp listed below. Written in the name of his wife at the time, this single made some noise in the charts and was popular locally, and rightly so. Both “Every Dog” and its flip are rockin’ numbers. Since Bo was also arranging, songwriting, and playing sessions for Ric at the same time Ridgley was recording for the label, recycling that riff on “Double Eyed Whammy” may have been his idea, or at least done with this blessing. Hell, maybe he took it from someone else in the first place. You’ll note that Bo repeats the riff much more here than it is used in the two songs above; and the melody line differs; but there was definitely a Bo contribution in the woodshed on “Whammy” and “San-Ho-Zay”. Another kink uncovered! I had to laugh about the lame attempt to even partially credit Tommy Ridgley on the single, showing the co-writer as “T. Rixby” . If Freddy was trying to make things right some five years after his initial rip-off, this was counterproductive, to say the least. Here King does a rocked-out blues vocal version of “Whammy” that is fairly faithful in the lyrics and melody. 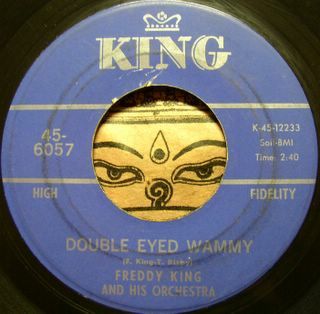 But, what’s really strange about his “Wammy” is that King doesn’t use the defining, attention-grabbing riff anywhere in it. Even with his great performance, the song just lacks some punch without those licks, to me. So, that’s the tale of how two of New Orleans finest songwriters and performers had an influence on two of Mr. Freddy King’s records, not that it did them any good. All four of these songs are outstanding, heard on their own merits; but, I hope the back story gives you a little more insight into and appreciation of those often obscure, convoluted HOTG connections. Four Kings (The Series): Going With B. B. We start off with a B. B. King single side taken from his MCA LP, There Must Be a Better World Somewhere. All but one of the songs on it were written by Dr. John (Mac Rebennack) and his frequent New York collaborator, lyricist Doc Pomus. They’ve done some fine work together over the years. The deep soul/blues title cut on There Must Be A Better World Somewhere has been covered by a number of artists since; but I believe the Two Docs wrote it and most of the other tunes specifically for B. B. With an outstanding lineup of mainly NYC session players*, plus Dr. John on keyboards and fellow New Orleanian Charlie Miller on trumpet, the album exudes uptown class with touches of jazz, R&B and gospel to the blues feel. Most of the songs aren’t roof shakers or rump movers; but are effective none the less. My particular favorites are the title cut, the soul/jazz of “Born Again Human”, the righteous “More, More, More” (By Hugh McCraken and Jay Hirsh), and, of course, today’s feature. Having Dr. John writing the music and radiatin’ the electric 88’s lends Crescent City credibility to “You’re Going With Me”. Although there is no album credit for over-all arranging, I would suspect the Good Doctor was the main contributor, although sax giant Hank Crawford arranged the horns. Pumpin’ bassist Wilbur Bascomb and legendary drummer Bernard “Pretty” Purdie funk up the strut here quite rightly, making the tune the lone loose booty track on the collection. B. B. sounds like he’s having fun riding this groove. So, that’s round one. B. B.’s iconic vocals and string bends meet the music of Dr. John,turned out here with some New Orleans style. It’s not the only HOTG hook-up for this King, but surely one of the best. What kind of New Orleans connections do B. B. King, Freddie King and Albert King have? Over the next week, I’ll feature cuts from these blues men, plus one from a local King - Earl, that is. No profound implications here. The songs, which I’ve run across at various points over the years, really have nothing to do with each other; but, there are various ways, obvious and not so, they each have an HOTG hook up. Thus, we cobble together a theme series of sorts: Four Kings. I was in New Orelans yesterday, all too briefly, listening to WWOZ as I was driving around, and noted that they are just starting their Spring fundraising drive. If you have not checked out this station online (or locally), I urge you to do so, as their mission is to celebrate the music of New Orleans 24/7. It is primarily a volunteer DJ programmed station; and, while not all genres are covered, the music content is generally excellent. 'OZ has long been the FM musical soundtrack of record (sorry) for the city. It's so hard to imagine New Orleans (and the world) without them that, when they were knocked off the air by Katrina, friends from around the country helped to re-establish their web-cast in short order. They are now back, broadcasting from the French Quarter. The survival of WWOZ should go hand in hand with that of the entire New Orleans community. So, listen to and support them, please. And, as a former "Left of the Dial" volunteer DJ, I ask you to also support any other musically diverse and valuable non-commercial radio station in your area or that you listen to online: WEVL, KRVS, WFMU, etc. They all struggle to survive swimming the airwaves with the whales and killer sharks of corporate radio in all its guises. When I was doing my research on Ric and Ron Records for the Mardi Gras series, I ran across a couple of nice unreleased instrumental tracks by Edgar Blanchard and the Gondoliers that I had forgotten about. These appeared on a Rounder compilation CD from the 1980’s called Troubles, Troubles that focused mainly on blues recorded for Ric in its early days, starting around 1958. 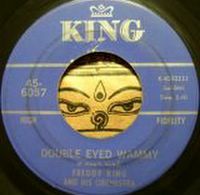 The sides, “Blues Cha-Cha” and “Bopsody In Blues” were to be issued as a single by Ric Records, but were withdrawn at the last minute for Johnny Adams debut release, “I Won’t Cry”. So, I thought I’d feature my favorite and give you some background on Edgar Blanchard, who is not well-know today. To me, “Blues Cha-Cha” (which is neither a blues nor a true cha-cha, it seems) has just a touch of cheesy lounge music feel (good in moderation) to it, with a groovy kind of afro-latin rhythm that I find hard to resist. Blanchard’s hip, solid arrangement, employing a central riff played by the saxes and his guitar, a rolling New Orleans piano throughout, plus that very danceable beat makes this little trifle fun to hear. I can imagine the band* playing it at one of their many club gigs back in the day and bringing the dancers to the floor for some hip-swaying action. Edgar Blanchard was certainly one of the most talented, popular, and well-respected guitarists in New Orleans from the late 1940’s into the 1960’s. But he did not do very much recording under his own name. After serving in WWII, he formed his own band, The Gondoliers. While working at Don Robey’s Bronze Peacock Club in Houston, the group was recorded by Robey for Peacock Records in 1949. The disk, “Creole Gal Blues” b/w “She’ll Be Mine After Awhile”, with Blanchard on vocal, did not do well; and they returned to New Orleans, playing primarily at the famed Dew Drop Inn. In 1950, Blanchard went out on the road with one the hot blues shouters of the day, New Orleans’ own Roy Brown, and became his bandleader, until leaving in late 1951. He can he heard on a number of Brown’s recordings from that era. On his return to New Orleans, he re-formed the Gondoliers and began playing club and road dates behind various popular acts of the day, such as Johnny Ace, Joe Turner and Ray Charles. By 1953, Blanchard was also doing a lot of recording session work in New Orleans for Atlantic (Turner, Charles, Professor Longhair) and Specialty, most notably with Lloyd Price and on some of Little Richard’s seminal mid-1950’s New Orleans sides. While working with the latter label, he also recorded two instrumental singles himself, “”Mr. Bumps” b/w “Ricki-Ticki-Too” (#585) and “Steppin’ High” b/w “Sweet Sue” (#586). Under the direction of Paul Gayten, Blanchard also made many recording dates in New Orleans during that period for artist signed to Chess or related labels, such as Eddie Bo, Bobby Charles, Clarence ‘Frogman’ Henry, and Gayten himself. In 1958, Blanchard and at least some of the Gondoliers cut a single for Argo (Chess), “Loud Mouth Annie” b/w “Heaven Or Heartbreak”, which was released in the name of Myles & Dupont, who were pianist Warren Myles and saxophonist, August ‘Dimes’ Dupont, who wrote and sang the tunes. Blanchard’s work with the newly formed Ric label began when two sides he cut for Ace Records, “Let’s Get It” and “Lonesome Guitar”, instead became Ric’s first issued single (#954) in 1958. Another single (#957), credited to just the Gondoliers, followed that. Blanchard stayed on to work as guitarist and arranger on many sessions for both Ric and Ron Records, owned by Joe Ruffino. He and the Gondliers also backed Johnny Adams on his sessions there. In the early 1960’s, Ric released an ill-conceived album on the band, Let’s Have A Blast, that I am told was terrible; and, that, unfortunately, pretty much closed the book on Blanchard’s recording career, although his group gigged regularly into the mid-1960’s. Born right down the road East of me in Grosse Tete, LA, Edgar Blanchard passed away in New Orleans in 1972. As you can maybe tell, I am a fan of his work. I’ve read that the various incarnations of his band could play well in many styles. So, don’t let this one track nail him down for you. I’ve got at least one of his Specialty singles in storage. I’ll try to get one of those sides to you later on.